My husband and I have known Greg (CWO President) and Laura Yoder for nearly 15 years and we couldn’t be more supportive of the CWO ministry. We attended the same church for several years and two of our sons went to Haiti with CWO along with some of our friends. We love how CWO not only meet the physical needs of men, women and children around the world, but how they make it a priority to share the gospel of Jesus Christ as it is presented from the Bible. We also appreciate the Feminine Training Center that teaches women skills that can help them support their families. One way we have chosen to help out with CWO is to donate a percentage of some of the acrylic paintings that I have for sale. I specialize in paintings of Colorado and Castle Rock, but also paint other beautiful places as well. One of my greatest joys in life has been learning how to paint with acrylics. I began painting 14 years ago, and after hanging paintings on my walls and giving some to friends and family, I realized I could also use my art skills to help raise funds for missionary friends and organizations. Each year I donate a few paintings to fundraisers. Recently my husband suggested that when I participate in art festivals I could designate a painting to a specific ministry and if it sells donate the money earned to that organization. 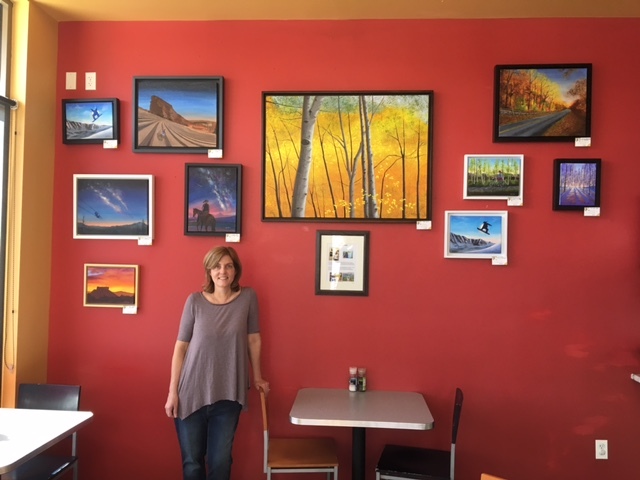 Presently I have several paintings for sale at the Miyo Café in Happy Canyon Shopping Center in Castle Rock. I chose a few paintings to donate to some mission organizations if sold. We put the names of all my paintings in a hat and did the same with some mission groups and matched them up. It’s an honor to support CWO in this way!